You are here: Home / Online Jobs / How to Make Money with Online proofreading jobs? • Getting lot of Text Document with full of Grammatical Error! • Open up them with Word Processor and Find the Mistakes! • And finally, check all Spelling and Grammar and get paid! • Getting text document may be an article and find all possible spelling and grammar mistake. • Fix them all and without losing the value of writer though and emotions. • Make that article more perfect and more meaning full. • Make Each and Every Line subjective and eye catching. • And Finally Add lot of Modern Word and Common term as per need to the niche. Why is the Purpose of proofreading jobs? We are truly going to entire into digital work. Here billion of website adding a ton of article , information , news into their website , no doubt without knowing good English grammar and uses of work people can write awesome staff. But it looks as bad impression while we see some minor mistakes into a website or books. This is why proofreading is so much popular, so if you have excellent writing skill and an outbox thinking on mordant English you would be a proofreader. So How to Become a Professional Proofreader? Before dreaming about to be professional make sure you have well reading and writing skills , remember a person without having excellence in reading and writing can’t be a good Proofreader. Sometimes your eye may be not enough to check out all the spelling and grammatical error so it’s a better idea to have Microsoft office word, Grammarly , etc. online tools and before your start proofreading double checked those data using such tools. There is so many institutes and online website are now available that offer proofreading courses, why not move your skill to the next level by taking proofreading courses. No doubt without know how to writer like pro writer you can’t become a good proofreader, you can follow a lot of style books and learn how to writer like a pro, that’s it. Now you know how to move an article to the next levee with gorgeous style book. Read a lot not because it increases the sense of common object and matter but it also helps you to make each and every work more subjective while you are doing any proofreading job. Go Online and using the internet you can start the proofreading test and get a score on the base of your proofreading knowledge and accuracy rates. Hence this type of online tools is not quite helpful but defiantly its work to improve and test your basic skills. Try one of them from here. 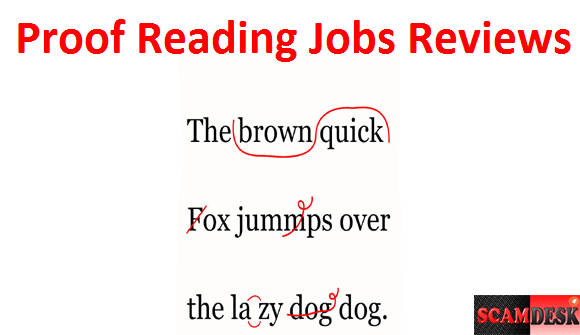 How much can you earn money by doing proofreading jobs? 1. Make a specialisation; instead of becoming a proofreader who works in all categories makes you strong in a particular category like science, media or medical. This how you be more choice-able than other regular proofreaders. 2. Use internet and contact website owner and webmaster and let them know you are willing to become a freelancer of proofreading jobs from home. 3. You can build your own website and start adverting with Google adwords and let people around your target and online proofreader finder know your benchmark and portfolio. Next to Read: How India housewife can start proofreading jobs from home? Your feedback: Your Suggestion and feedback is so much valuable to us, why not give us some feedback about this article and let me know which of the part is need to improve and mostly liked by you. Don’t forget to share your opinion here. A Quick share into your Facebook, Google+ or twitter will be 100 times more inspiration for us to bringing such article into our blog scamdesk.com. An article on proof-reading which does NOT SEEM to have been PROOFREAD! What an irony! While your sentiment is appreciated, author-who-writes-as-Sri-Ram, and so is your effort of trying to expose online-typing-job scamsters cheating Indians; you need to proofread your articles (or get them proofread professionally) if you would rather continue to post in English. On the other hand, you could probably post in your “mother-tongue” i.e. native language if you’re more proficient in that. Ronnie you’re absolutely right. You recognised your synomous type.